Last month, after a couple of delays I finally managed to appear for the Salesforce Certified Pardot Specialist and Consultant exams and managed to pass it on the first attempt. I approached studying for the exam in a very methodical way, so I thought it would be good to do a write up on how I prepared and what materials I used. I took around 3-4 months time to learn Pardot and prepare for both the Pardot Certification exams. Salesforce offers various certifications and Pardot is one of them. It can be an excellent opportunity to learn about Pardot and boost your career graph by demonstrating your Pardot knowledge along with your Salesforce experience. The most common Pardot certification is the entry-level Specialist Certification. The Salesforce Certified Pardot Specialist credential is designed for individuals who would like to demonstrate their skills and knowledge in designing, building, and implementing marketing workflows through the Pardot platform. To know more about exam details and exam objectives browse Salesforce Certification site. If you are new to Pardot, or you have few months of Pardot working experience and want to learn more about this tool, then Pardot Specialist is right certification you can focus on it. There are so many training resources available online, but I will suggest you to use the recommended reference materials i.e. Study Guide Salesforce has prepared. 1. A great place to start is the Pardot eLearning Modules home page. There are ample amount of videos, will help you to get started with Pardot. It’s my suggestion to spend at least 2-3 hrs per day to watch these videos and complete #28 video series in a month time. 2. In the mean time, visit Pardot Client Services Calendar page and signup for webinars. Pardot has excellent Client Advocate team, they will help you to learn it from scratch, also providing consultative advice on Pardot strategy, marketing automation best practices, and industry trends. If you have a query or want to learn Pardot from basic, it’s my suggestion to signup for New User Overview webinar. Thanks to the Pardot Advocate Team for offering webinars, open office hours and for providing the roadmap on how to achieve it. 3. Once you have the proper understanding of Pardot, then open the Pardot Specialist study guide and visit Pardot knowledge base, Search for each and every topic mentioned in the Study Guide. Don’t forget to browse FAQs page for each and every topic mention in the study guide. 4. 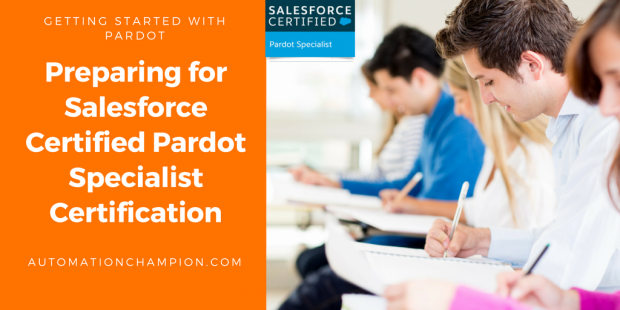 Once you are ready to appear for Pardot Specialist or Consultant certification exam, then visit the Official Salesforce Certified Pardot Specialist Preparation page and expand each section to access the collected resources. The Certified Pardot Consultant exam is bit difficult compared to the Certified Pardot Specialist exam, but gaining the credential can give you a significant advantage over other marketing automation professionals. Have you taken the Certified Pardot Specialist exam? Are you preparing for the exam now? Share your tips in the comments!